Every week, we'll be sitting down with one of our gallery artists to discuss their work, process, inspiration, and stories. This week we're speaking with Nancy Cohen. Nancy Cohen's sculpture explores the juxtaposition of fragility and strength. 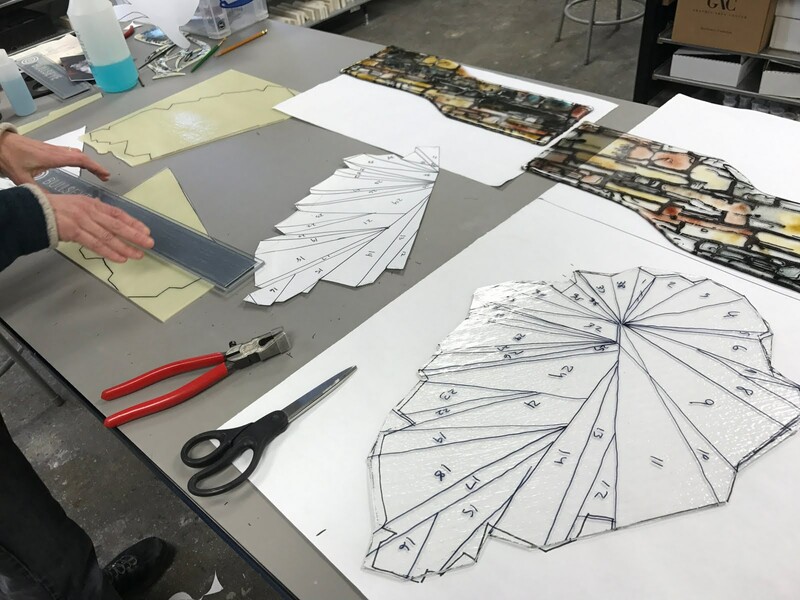 Made with a wide range of materials, but primarily with glass and homemade paper, the interdependent elements hang in the balance, a vulnerable but necessary part of the whole. Her work investigates the journey of the individual navigating a perilous world, all while exploring the fragility of that world itself. Through personal study of waterways and collaborations with scientists and environmentalists, Cohen imbues her work with academic references to a natural world that is fighting back while constantly under threat. 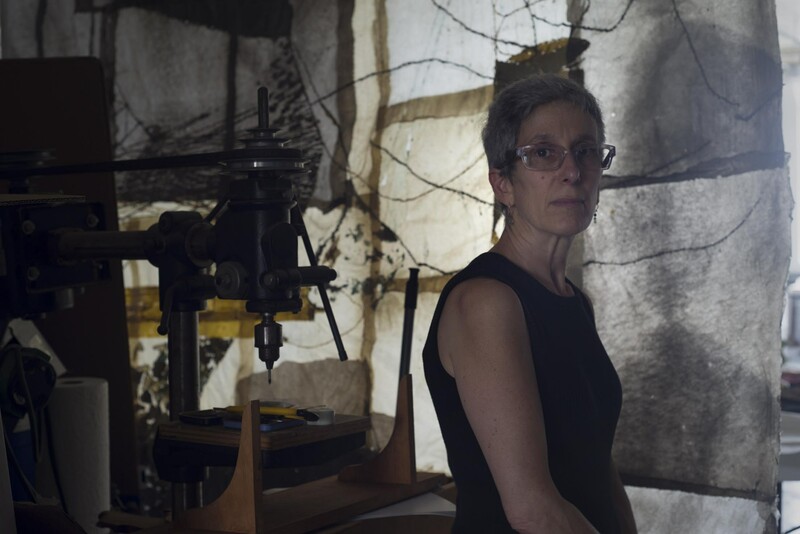 She spoke with us from her studio in New Jersey about what appeals to her about her materials, how the tension between industrial development and nature inspires and reflects in her work, and her collaborative projects. How and when did you start becoming an artist yourself? What was the path like to finding your current voice? I have always worked three-dimensionally and it has always been materials based and process oriented. To say it another way, I have always worked with my hands, in an intuitive and exploratory way—with ideas in mind but very much open to where the work in process might take me. My undergraduate education was in ceramics at the School for American Craftsman at Rochester Institute of Technology. I was drawn to clay for its malleability, the variety of forms and methods I could engage with in making it, its ability to be both matte and translucent and finally because the material itself transforms en route to its finished form. So while the artist has control there is always the unknown and unexpected at play as well. Although I rarely use clay at this point I maintain a pull towards materials that share those qualities. I don’t identify myself as a person working with particular materials or methodologies – that is in flux as the work and new ideas evolve. After undergraduate school I did an MFA in Sculpture at Columbia University and spent the following summer at Skowhegan. Both of those experiences exploded and broadened my thinking about art making, art history and contemporary art. Several faculty members and students from then remain close friends and colleagues. I am grateful to have had those experiences. The sculptures I will be showing at the gallery have been made over several years. They begin with an idea about form and an experimentation with materials. I think of it as a juggling act between intention and intuition. All the sculptures have a large component made in glass. 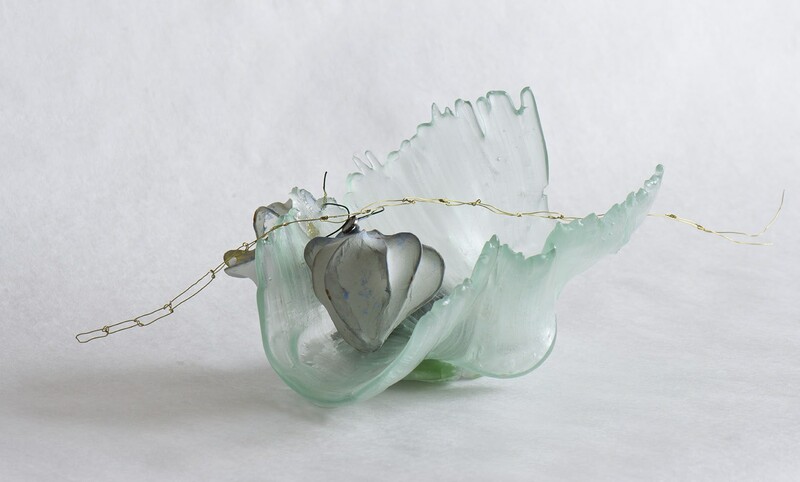 The earlier pieces use a variety of found glasses – window glass, marbles, cosmetic bottles and tableware that I have melted and reformed in a kiln over molds made in clay. I’m interested in the reference to their former use that becomes a part of the meaning of the work. The more recent pieces use glass elements made earlier this year during a residency at Bullseye Glass. That residency allowed for an opportunity to experiment with a huge palette of colored glass and introduced new processes and possibilities into my work. Some of the pieces which began during the Bullseye residency feel to me as if they are three-dimensional paintings, being optical as much as physical. In all the sculptures the glass elements have been combined with other materials – often wire forms covered in some way in handmade paper. 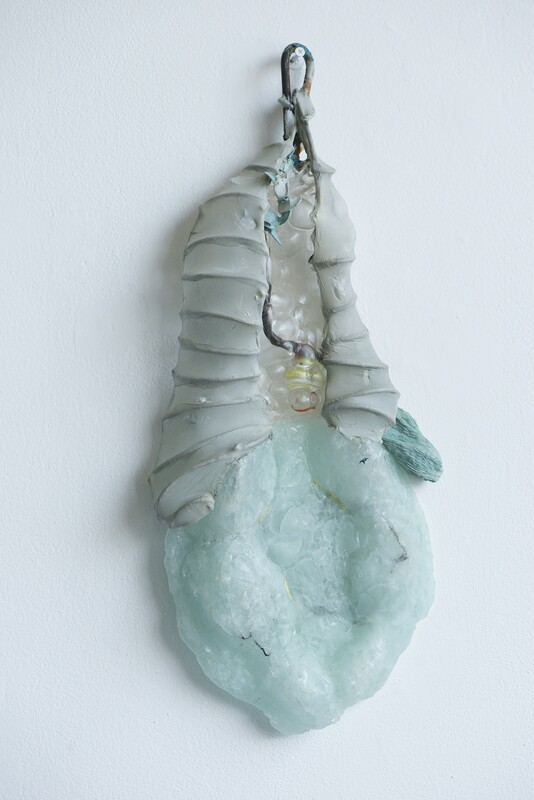 For now, working in glass and handmade paper – two materials that are both fragile and strong, ancient and contemporary, with the capacity for opacity and translucency are both stimulating to work with and feels very in- sync with the work I am trying to do. In all my work I am hoping to evoke a physical, visual and emotional experience in the viewer. Do you have a scientific background at all? If not, how did you become interested in/inspired by the environmental concerns that you explore in your work? I don’t have a scientific background. I have always made work that either relates to the physical human body or in some way to water. I was doing that before I realized it and those two strands seem to come through in the work even when I think I am working on something else. I think my connection to water comes from living on the edge of it. First growing up in Queens with the Whitestone Bridge out my bedroom window and the Throgs Neck Bridge being built during my childhood and spending my early summers with my grandparents who lived down the street from the Atlantic Ocean in Long Beach, Long Island. You could hear the waves as you slept. As an adult I have been living in Jersey City with a studio for 20 years overlooking the Hudson River and overseeing enormous development and my displacement from the Jersey City waterfront and now with a studio quite close to the Hackensack. My interest in water developed intuitively responding to forms, colors and sounds and as an adult thinking about the pollution and protection of our water ways and the transformations both positive and negative over time. Living in NJ for 30 years the tension between industrial development and ‘nature’ has become a serious interest of mine. Although I haven’t studied this in school I have studied it on my own – reading, speaking and working with scientists and environmentalists in a variety of situations but many relating to NJ waterways. Last week I spent a day on the waterfront in Elizabeth, NJ. You could call it some kind of industrial and post-industrial wonderland/wasteland. Along the NJ waterfront (and facing Staten Island with similar issues) are a combination of abandoned and still functioning factories. There are pipelines of various sorts with warning signs not to dig, bridges under construction and demolition, marshes filled with garbage, people fishing next to signs with serious warnings not to eat the fish and finally a group of 4 egrets majestic and adaptive, flying, landing and fishing in the marshes. I am compelled by these contradictions and adaptations. Could you talk a bit about how you've worked with scientists and environmentalists to enrich your work? My first collaboration with scientists in 2006 was daunting and thrilling. I was invited to collaborated with Shirley Tilghman, molecular biologist and then president of Princeton University on “Sensation: Interior View” as part of a series of collaborations between scientists, artists and landscape architects for Quark Park in Princeton, NJ. Our piece was based on research about how mice perceive smell and our idea was to create an environment that evoked a scientific occurrence rather than illustrating one (as an exhibit in a science museum might do). In the end our collaboration grew to include Jim Sturm, Professor of electrical engineering, a group of his graduate students and A.R. Wiley, a garden designer. The sculpture incorporated electroluminescent wires designed to appear to move through the piece as neurons might move when sending a message back to the brain. The area was landscaped with fragrant herbs underfoot and fragrant flowers that opened at dusk as the electroluminescent lights first began to be evident. It was a visually, conceptual and sensual environment. It was an extraordinary collaboration where all of us were stretched in new ways. I was stimulated by attempting to understand and integrate a scientific concept into visual form, to work with technology and a wider range of people than I was accustomed and to communicate on a variety of levels – both to a core group of people with whom I had regular contact and to a larger community that would be experiencing my work without me. I have done 5 installations based on environmentally compromised rivers since the project I just described. Some have been collaborative or had collaborative elements but all have been greatly informed by knowledge gained through other people and experiences outside the studio. With each project I have stretched my work - although those projects are large scale and develop over several years their overarching ideas filter back into my more intimately sized sculptures as well. You mention in your statement that your work also explores "individuals navigating a perilous world," along with issues relating to the environment. What threats do you confront in your work, and how? Does your work on paper investigate similar subjects? Are you making the paper yourself, or working with homemade paper? For the past 20 years I have been working with handmade paper. It began during a residency at Dieu Donne and has continued as an integral material for me. 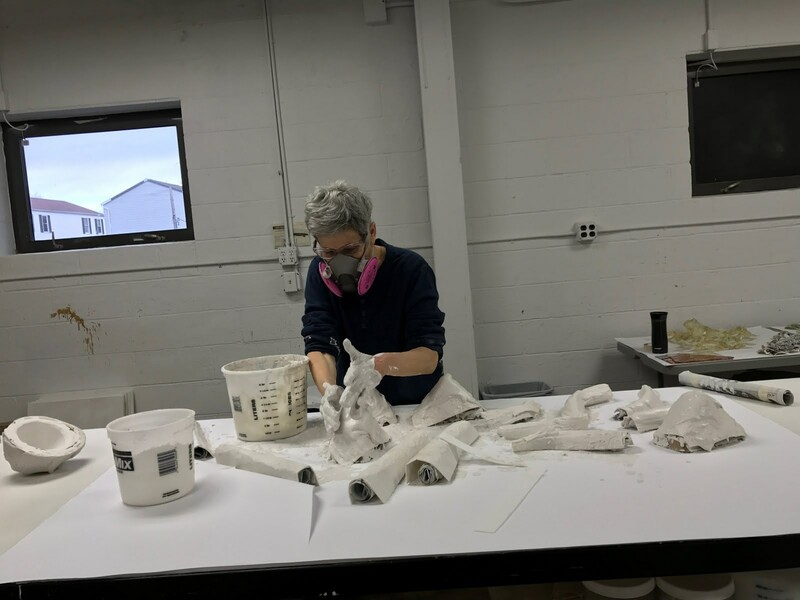 I have worked with handmade paper in large scale installations for public buildings and for the inside of a greenhouse, on the surfaces of sculpture both large and small, and as a paper to draw on. I continue to make my paper at Dieu Donne (originally in Chinatown and now in the Brooklyn Navy Year) and bring it back wet to my Jersey City studio to work with. Several years ago I began making largescale drawings (the largest is 11 x 15 feet) where all aspects of the work – both the surface and the ‘drawing’ on it are handmade paper. I am finding it a thrilling scale to work on. Because I have made the material myself, I pigment the fibers while I am working so the color is in the material itself, rather than applied later, which creates (for me) a feeling akin to making sculpture. In my most recent drawings and sculptures, despite the change in both material and scale, the imagery and the feeling in the work are strongly linked. They are clearly operating in the same world. My son spent last year living in Bolivia and I visited him twice. There were several experiences of the landscape that I have been working with. One is Salar de Yuni, the salt flats in South Western Bolivia which is the most desolate place I have ever seen, and one of the most beautiful and the other is Valle de la Luna, a mountain range in La Paz which was also extraordinarily beautiful in its sculptural forms, visually mysterious and somewhat akin to the Badlands of South Dakota. I am finding myself very interested in the mountain forms and the process (and metaphor) of erosion. In my studio right now I have just completed several large scale drawings that relate to the salt flats and a series of glass sculptures evocative of the Valle de la Luna. Varying visitors to my studio are finding the ‘mountains’ either beautiful and ethereal or extremely creepy. I am quite interested in navigating the space between those two possibilities. Where my work goes next is always an open question. The images I described from the Elizabeth River are floating around in my head and I am sure I will work with them sometime down the road. Explore more of Nancy Cohen's work here. Nancy's work is like sculptural poetry. Even her large pieces have a flow and a movement that is at once calming and peaceful but still quite pleasing to the eye when she uses vivid colors.